Rango (2011), a box-office success directed by Gore Verbinski, is an animated comedy movie featuring a pet chameleon named Rango who accidentally ends up in the town of Dirt. Synopsis: Rango is a pet chameleon always on the lookout for action and adventure, except the fake kind, where he directs it and acts in it. After a car accident, he winds up in an old western town called Dirt. What this town needs the most is water, but they also need a hero and a sheriff. The thirsty Rango instantly takes on the role of both and selfishly agrees to take on the case of their missing water. That's an awesome and solid cast. 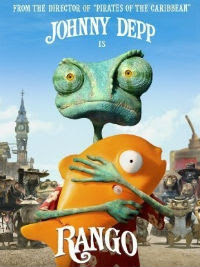 I'm not surprised that Johnny Depp gets to voice Rango. He works with Gore Verbinski in the Pirates of the Caribbean movies. Bill Nighy is Davy Jones in Pirates of the Caribbean: Dead Man's Chest. Rango is said to be a smart, giddily creative burst of beautifully animated entertainment, and Johnny Depp gives a colorful vocal performance as a household pet in an unfamiliar world. It's also described as an animated comedy for smart moviegoers, wonderfully made, great to look at, wickedly satirical. It respects the tradition of painstakingly drawn animated classics, and does interesting things with space and perspective with its wild action sequences. Well, I find Rango projects a rather heavy message. It's definitely not a heartwarming animated movie with delightful colors and wonderful sing-a-long songs. Rango talks about natural disasters, consequences of selfish leadership, self-deception, so on and so forth. I find it rather negative and mind-boggling most of the time. Some scenes even left me crestfallen. Nevertheless, if you like a solid, not-so-ordinary animated movie, Rango will do you good.